The Snøhvit LNG project was constructed to exploit the resources of three gas fields in the Barents Sea: Snøhvit, Albatross and Askeladd (250m to 345m deep), which lie about 140km northwest of Hammerfest in Norway. These fields, which were first discovered in the 1980s, have estimated reserves of 193 billion cubic metres of LNG and 17.9 million cubic metres of condensate and 5.1 million tonnes of natural gas liquids (NGL). The Snøhvit and Albatross fields came onstream in 2007, while the Askeladd is due to come onstream in 2014-15. The gas production system is one of the first in Europe to use a subsea production platform, which feeds gas via 143km of pipeline with multiphase flow to a 4.2 million tonnes a year LNG processing plant on Melkøa Island near Hammerfest. The project also has a carbon dioxide capture and storage facility located 2.6km beneath the seabed of the Snøhvit field and a 153km pipeline for reinjection. The facility can store 700,000t of carbon dioxide annually. The project was led by Statoil as part of a consortium of eight companies. The consortium consists of Statoil (33.53%), Petoro (30%), TotalFinalElf (18.4%), Gaz de France (12%), Amerada Hess (3.26%) and RWE-DEA (2.81%). The LNG processing project required finance of over $5.3bn (Nkr51.3bn), partly provided by the Japanese Bank of International Commerce. The project was authorised by the Norwegian Parliament in 2002 (subject to some clarification of the terms of distribution of revenues and taxes) and construction on the project began in late 2003. The facility started production in September 2007 and will be used until 2035. The production capacity of the new single train facility is 4.3 million tonnes per year (equivalent to approximately 5.6 billion cubic metres of LNG). Supply contracts were agreed with customers in the US east coast (El Paso) and Spain (Iberdrola), accounting for four million tonnes per year (the remaining capacity and any future expansion will go to Gaz de France). 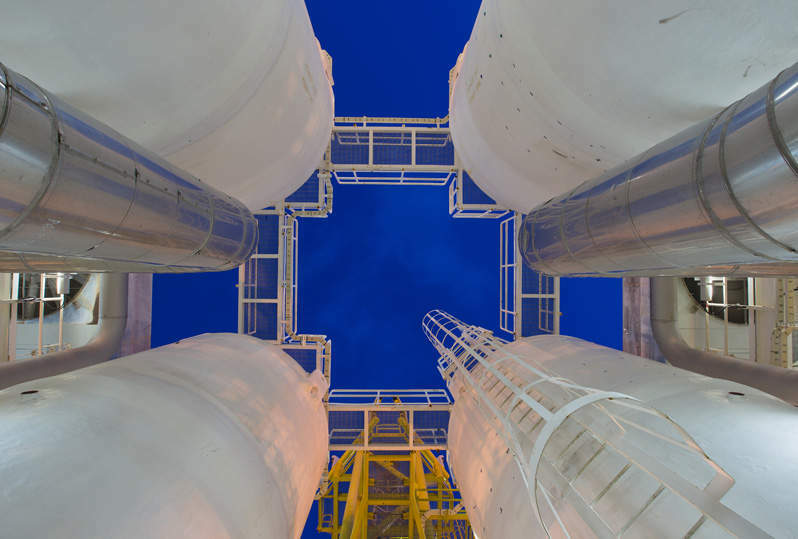 The unprocessed gas arriving at the LNG processing facility contains between 5% and 8% carbon dioxide. This is separated out at the processing and liquefaction facility and returned via a separate 160km pipeline for storage / sequestration beneath the seabed (2,600m below the sea bed on the edge of the reservoir in the 45m to 75m thick Tubasen sandstone formation), thus preventing undue pollution and allowing Norway to adhere to the Kyoto treaty. The energy efficiency of the liquefaction facility is 70%, which is the best yet achieved in any plant of this kind across the world (the compressor operates with an efficiency of 230kWh per ton of LNG). The management, engineering, procurement and construction contract (€380m) was awarded to Linde AG for the provision of key equipment for the LNG terminal. Linde uses MFC liquefaction technology developed jointly with Statoil (Air Products and Philips also contributed technology to the liquefaction train). The instrumentation for the facility was supplied by Parker Instrumentation. Aker Kvaerner was awarded a contract in early 2005 (worth an estimated Nkr1bn) for important completion work at the LNG facility at Melkøya Island. This contract involved Aker Kvaerner Elektro (for electrical and instrumentation installation), Kaefer IKM for scaffolding, insulation and surface treatment and Aker Stord for management of this section of the project which involved installation and integration of the liquefaction / process equipment into the island infrastructure. Aker Stord was awarded the main hook-up and installation contract on Melkøya Island in 2003 and was awarded the contract for preparing the infrastructure and equipment on the island. Aker Kvaerner employed over 800 personnel working on the island over the first half of 2006 so that the project could be completed on schedule. The heart of the Snøhvit LNG facility, the liquefaction plant, was borne and operated on a gas liquefaction barge, which was constructed at the Spanish shipyard group Izar Construcciones Naval (Dragados yard) in Cadiz. The barge construction contract was worth an estimated Nkr170m. The process barge measures 9m×154m×54m. This process barge approach was chosen because it greatly reduces the need for steelwork on Melkøya Island, necessitates a compact efficient design, allows prefabrication of modular components off-site in a convenient dry-dock situation and, most importantly, gives cost savings as well as higher productivity compared with constructing the plant on site. Following completion of the barge in May 2005, it was towed to an outfitting yard where 24,000t of process equipment for the gas liquefaction plant was installed on the deck. The barge was then transported to Melkøya Island in July 2005 on a heavy-lift vessel and installed in a custom-built dock. The completion work for the barge on the island was completed by the end of August 2006. Parker Instrumentation supplied all of the instrumentation components and sub-systems for the Snøhvit LNG project. They provided over 1,000 H-series manifolds, 20km of conventional and heat race tubing and many thousand twin-ferrule A-LOK compression tube fittings. The components were supplied fabricated in 316 stainless steel and, for areas where corrosion is a major problem (sea water cooling systems), in 6% Molybdenum steel. Parker also used its Supracase process to harden the ferrules of the fittings and avoid the affects of corrosion. The instrument enclosures provided by Parker are weather proof and equipped with antifreeze systems to allow them to operate at temperatures below -25°C. The consortium needs four 145,000m³-capacity carriers to deliver the LNG to receiving terminals in the US and southern ports of Europe (investment for these new ships was nearly Nkr5.4bn). Arctic Princess (launched in April 2007) delivered the first 145,000m³ LNG cargo from Snøhvit to southern Europe in October 2007. Arctic Discoverer docked at the Cove Point gas import terminal in the state of Maryland, south of Washington DC, after a 12-day voyage across the Atlantic in July 2008. It is estimated that 70 cargoes of LNG per year will be shipped out from the Melkøya facility. The annual exports are estimated to be 5.75 billion cubic metres of LNG, 747,000t of condensate and 247,000t of liquefied petroleum gases (LPG). The total investment included Nkr34.2bn for field development, pipeline and land plant and Nkr5.4bn for ships. DYWIDAG Systems International (DSI) was responsible for the supply and installation with stressing and grouting of a total of 1,650t horizontal and vertical DSI post-tensioning tendons with accessories in the construction of the tanks to allow them to withstand the extreme conditions. The weather conditions during the construction were of an extreme Arctic nature. The tank walls were constructed by means of a slip formwork with a performance of two metres per 24 hours within a few weeks. A particular challenge was the installation of the vertical tendons with 12 strands. The vertical tendons of the tanks are typical U-shaped or loop tendons. A loop tendon consists of two vertical tendons, which are connected at their bottom ends in the foundation by a 180° arc. Despite a maximum tank wall height of 40m and an arc radius of only one metre the installation of the loop tendons by pushing single strands was carried out without any problems. In April 2005 the Solitaire laybarge started laying the 143km pipeline from the western side of Melkøya. The vessel continued towards the Snøhvit field at a rate of 3-6km per day. Laying the main pipeline was completed in mid-2005. Onboard Solitaire, 12.2m sections of pipe were welded together in a continuous process. The sections are fed out through an opening in the stern of the laybarge, ensuring that the main pipeline is curved correctly during the laying. Solitaire was supplied with new pipe by three pipe transport boats, which provide a shuttle service between the laybarge and the pipe storage area at Polarbase outside Hammerfest. The 28in-diameter linepipe is made of steel with an outer coating of reinforced concrete. Each pipe section weighs between 8t and 10t, with a total of 11,000 sections making up the main line. ‘K’ Line (Kawasaki, Kisen, Kaisha Ltd) was taken on as the partner of Statoil in the Snøhvit LNG Coastal Transportation Project. In turn ‘K’ Line selected OSM Ship Management as its Norwegian project partner. The project involved the delivery of LNG from the Snøhvit LNG Plant to Norway’s coastal cities and its neighbour countries by small LNG vessels (this accounts for the remainder of the capacity of the LNG facility). The parties have worked with LNG Norge (a subsidiary of Statoil). The idea was then developed into a long-term charter for two 140,000 cbm (Moss-Rosenberg tank type) LNG carriers worth Nkr3bn ($337.2m). ‘K’ Line and Statoil are the owner-operators of the vessels, which were delivered in April 2007. The vessels were initially engaged in domestic transportation, but their activity was later expanded to ports in neighbouring countries. In 2004 the Snøhvit partners also signed a deal with Leif Hoegh and Co and Misui OSK lines for one vessel to serve the project during a 20-year charter. The ship was built at Mitsubishi Heavy Industries and was delivered in late 2006. In addition, TotalFinaElf and Gaz de France have commissioned their own vessels to transport their share of the gas. The Snøhvit LNG plant at Melkøya had a troubled start-up period that saw it shut down four times after it came onstream in September 2007. StatoilHydro shut down the production from the field from June 2009 to November 2009 for repair and upgrades of the onshore plant cooling system. A closure on 7 November 2007 was caused by a sea-water leak in a heat exchanger in the cooling system of the Melkøya liquefaction plant. The plant then resumed production in mid-January but was closed again in March 2008 for cooling system difficulties and then reopened in July 2008. The heat exchanger at the plant is expected to be replaced in the second quarter of 2011.